Yeah, you heard us. Take off your writer’s hat. We’re here on the cusp of revision on MomWrites – Abby’s finished with her novel, finished driving down the east coast with two kids, two dogs, and a hedgehog, and Melanie’s a mere two chapters away from being FINISHED (so, practically there. Almost). Join us as Jennie, Abby and Mel talk about what’s next for their books. 1) “Where's the publisher? I'm ready for the publisher!” The reality is, editing and revision is just the next step towards that goal, and what’s really going to turn your book from good into great. Nothing is ready to publish on the first draft—nothing! 2) The other tendency people have at this point is to circle back to the beginning and do precisely the same thing that they did to write the book. But revision is not the same process as drafting, and it needs to be treated as its own thing because it IS. Rushing through it is a mistake—take your time! Revision is when we take our writer’s hats off. This is not the process of creation. It often helps to revise in a different physical space than where you did most of your book writing. For instance, if you wrote your whole book at the kitchen table, maybe it’s time to move to a desk in the bedroom, or the couch, or a library or coffee shop or friend’s house. Just being in a different physical space helps you remember that you’re doing something different than creating. Using a coach during this process can be especially helpful because it brings an entirely new perspective to your work – a reader’s perspective, but one that’s been trained with an eye for revision. A good editor brings four perspectives to the table – 1) you, the writer, 2) the reader, 3) the character and their history, and 4) you, the person who’s lived your life. All of these perspectives together is like going from looking at a picture Michelangelo’s David in a book to standing underneath it, walking around, viewing the art in 3D. Is revision scary? Yes, absolutely! What if you take a look at what you’ve written and you don’t like it? What if you don’t like a little bit, or what if you don’t like a WHOLE LOT of it? Honesty about what you’ve written and where it will sit on a shelf, and why a reader might pick it up is one of the most critical aspects of revision. Hard decisions will be made, hard truths will be faced, and you’ll have to own up to some really stinky pieces of writing in your book—and some really great ones, too. 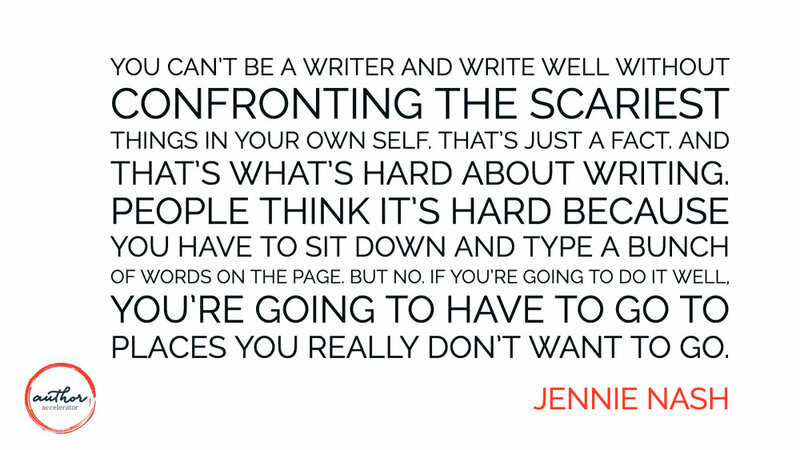 This brings us to the final word of advice Jennie has for us – be brave. Know that you have it in you to make the hard decisions, to make the hard choices, to see your book for what it really is and for what it can be, trust the process, and then go do the thing that makes it great. Starting your revision is a great place to pick up a book coach. Or, Abby and Mel’s case, a great time to change coaches and get a fresh pair of eyes on your work. Today Jennie and Abby want to introduce listeners to Kemlo Aki, a senior book coach at Author Accelerator. Does Kemlo’s voice sound familiar? It should because she was on a (very) early episode of Mom Writes! Welcome, Kemlo! You can read more about Kemlo on her personal website, which you can find here. You can also see her coach page on the Author Accelerator website (and listen to a tiny interview where she talks about why she loves coaching) if you click here. Mom Writes is following the typical developmental process of a writer(s) coming into a novel, from scratch and all the way through to a polished manuscript. And right now we are starting REVISION! Jennie talks about how revision is SO critical, and that if your book isn’t finding traction in this world, this is most likely the place where things went wrong. They haven’t revised correctly. Listen as she talks about the bravery of revision. Revision isn’t copy editing and making pretty sentences. That comes WAY later. Revision is still looking at big structural elements and spending time to circle around your story, revisiting it, making it the best it can be. You have to look at your story and be totally honest. What do you really have? Did it capture the vision you wanted? So how do you determine that? Surprise, surprise. Jennie (Queen of the Process) has a process for that. In the next episode, Jennie shows us how to identify the big, fatal things in our WIP that, if left unfixed, will break a manuscript. Can I take a moment to plug our retreat with the #AmWriting podcast ladies? Its called the Find Your Book, Find Your Mojo retreat. It was KJ’s idea, really, so we should give her the credit. But I’ve been working hard on all the details to make it an unforgettable weekend of friendship and writing and laughter. Our dearest hope is that you’ll come with your writing buddy or your writing group and learn how you can use Jennie’s Two-Tier Outline to help you move your writing forward. The Two-Tier can be used at any point. Really. Any point. (I should know, I refer to and rewrite mine all the time.) It’s small and powerful and social, and we will show you how to use it by yourself and with your writing group to help each other move forward. I’m bringing my friends. Join us and bring yours! We are gearing up for Season TWO of Mom Writes. It’s all about REVISION! And to kick things off, Jennie is going to give a webinar about the Stoplight Method. It’s part of her revision process, and it helps you identify how best to use your time when tackling your revision. If you would like to sign up for the webinar, you can do so HERE. Mom Writes is teaming up with the gals from #AmWriting for a retreat! We want to invite listeners of our podcasts to join us at the Find Your Book, Find Your Mojo Retreat in Winter Harbor, Maine, from September 12-15, 201. Jennie Nash and KJ Dell’Antonia headline this intensive retreat designed to help you start strong, get unstuck, or plan your revision using Jennie’s Two-Tier Outline system. This episode we welcome KJ Dell'Antonia, former NYT parenting writer/editor and cohost of the #AmWriting podcast! Her book, How To Be A Happier Parent, comes out in August 2018. -We discuss how to shifting your perspective from the mom guilt of putting your writing first, to setting an example for your kids with your writing. - If you're going to write about parenting, whether it be essays or journalism or stories, it's important to balance the respect for your kids' privacy while still being cognizant of the fact that parents have a need to commiserate over the common aspects of parenting that everyone deals with (KJ sites a favorite essay by Naomi Shulman, linked below). Universal truths speak volumes to your readers. - When you sign up for something like NaNoWriMo, one of the challenges is to keep going after you get to the end. It's great to finish, and it's great to win, but don't put it down for too long! According to KJ, forming the habit is the hardest part. It's okay to put your writing first most of the time. While family comes first for all moms and dads, you're still allowed to be yourself, to have this part of yourself to nurture and maintain. And sometimes you have to get up early to get that time, but it's not permanent. One day the kids will sleep later than you! -Having your work right in front of your, every single day, is paramount - out of sight is really out of mind. - Another great way to hold yourself accountable is to set goals with writer friends for a particular word count or writing goal, and send each other updates. It's not competitive as much as it is motivating! - If you parent with a partner, split up your responsibilities if you can. If you go to two hockey performances, the partner gets the orchestra concert, and when you get a night off you get to spend that time writing. If you're solo that day--or every day--bring your laptop! Ten words are better than nothing. In regards to watching your kids play sports, according to research, "The least-favorite part of the sport is the ride home." They don't need to be watched and don't want to be watched 100% of the time, and you can use that time to your advantage. And it's OKAY to say no to All The Activities. Your kids can pick and choose their passions, and it's healthy to have to prioritize and make choices. It's OKAY to tell your kids no sometimes, that you will take care of whatever when you finish what you're doing, it's okay to let them figure things out for themselves (we're talking about getting themselves a glass of milk, not asking your three year old to walk themselves to school). Welcome back to another encore episode of Mom Writes. While we are taking a break between Seasons 1 and 2, we are re-releasing some listener favorites. You can’t hang around us too long without hearing the name Dan Blank. And today, we bring Dan back to the show for this conversation on creative obsession. Next week we will re-release another interview, KJ Dell’Antonia from the #AmWriting podcast. KJ and Abby met through Dan. KJ and Abby and Jennie also have a BIG ANNOUNCEMENT! We are hosting a Mom Writes/#AmWriting writing retreat in Maine in September! It’s all official, so tune in next week for details and to find out how to register. You can also get on the interest list here. We talk about Dan's specialty - helping creatives get the most out of their time. Dan's Mastermind class welcomes creatives of all stripes - writers, photographers, artists, etc. Dan's class tackles issues we deal with on a regular basis, co-operatively - you get feedback not only from Dan but all your Mastermind classmates. Obsession is a necessary component for writers. If you can't obsess about your book for the time it takes to get it done, it won't get done. Donald Miller of the Storybrand podcast states that the first quality you have to have to write a book is that you have to be able to obsess about it for at least a year in order to see it through. A year! We know - it's a long time, but that's usually about how long it takes (if not longer) when you've got a full plate, as most of us do. In life, we've got so much on our plates - unless you're radically clear about what's important to you- you're going to flake on everything, go a mile wide and an inch deep on everything. Radical clarity is knowing what you want to do, and why. Once you've got that lined up your motivations and plans can fall more easily into place. Dan compares this to show up no matter what - this is your profession, your chosen passion. You'll lose the battle if you hem and haw on whether or not you have time for your work. Abby decided that even though everything else was up in the air with her move, she was going to show up every morning even if the words wouldn't come. Dan says that writing every day, even if you don't feel like it, averts the crisis of guilt that happens when you don't show up. Holding yourself accountable, and having others hold you accountable, is something you can use to give yourself the kick in the pants. Sometimes you have to create this for yourself via writers groups, critique partners, or certain individuals that you know can motivate you when you're stuck. To celebrate the launch of Season Two of Mom Writes, we are planning a webinar on revision with Jennie (as well as a big giveaway)! Come and learn the same techniques that Jennie teaches Abby and Mel that they will be using in Season Two. The webinar will be happening mid-April and will coincide with new episodes of the podcast, so stay tuned for details! In the meantime, we are rereleasing a few encore episodes. This week we had a listener request for Episode 38: Doing All. The. Things. If there’s an episode of the podcast that you are particularly fond of or that you found particularly helpful, let Abby know in the comments and we’ll add it to our rerelease list. As an aside, this episode was originally titled Fear & Writing. Not sure where or why along the way it changed, but that title was the file name for this episode on my (Abby’s) computer! One of the most challenging aspects of writing is pulling it all together - what you know about your story, what you know you should do with your story, and all the plot lines and characterizations going on in your head. In this episode Mel and Jennie discuss raising the stakes, avoiding info dumps, and where the line is between not enough and too much information. Jennie points out that Mel needs to work on remembering your character's history and motivations when continuing the story - be more in your character's heads. When your character is an expert on something, or is well-versed in a certain profession, they need to swim in that water all the time and see things through their own personal lens, and you've got to commit to consistency in their reactions to events. Characters are rarely neutral about things that affect them or the things or people they care about. Jennie and Mel also address info dumps: When you're learning how to engage the reader sometimes it's three steps forward two steps back - lots of repetition means that you're already getting down what you need. There's nothing wrong with doing an info dump as long as you recognize that you need to eventually revise and make it more nuanced. The kind of nuance you're looking for is subtle and placed in thought, dialogue, story details, etc. Info dumps in general box the reader out, but the reader wants to be IN the story, IN the scene, IN the character's head. Ask yourself: "How can I put this back in a moment, back in the scene, and filter the rest of the information through the narrator or character themselves?" The goal is to recognize when you're doing it and know that you can go back and clean it up. It's much easier to go back and fix something that's too much than not enough. Stephen King says, "I'm convinced that fear is at the root of most bad writing". If you're not dialing it up to 11, maybe you need to stop playing it safe and take the risks you need to go farther in your story. Fear of what, though? The fear is about looking at your true self - if you have to sit and examine the nitty gritty details of how your characters make decisions, how YOU or anyone you know might react to anything in your story - that can be a frightening thing. As writers, some of our biggest fears surround being exposed when our readers see us for who we really are through our work. Abby, Jennie, and Mel close out the conversation with a discussion about art and how it teaches us and connects us as human beings. Many writers seem to have this fundamental dissatisfaction with the way the world is, and a fundamental desire to understand it better. The art that captures our hearts is that which imparts some sort of understanding about those universal struggles and truths about the world. That--the connection with others--is what keeps us coming back to our favorite works of art again and again, whether in writing, photography, painting, or music. We did it! Both Melanie and Abby have reached THE END on their first drafts. And since iTunes gives the options for different “season” to a podcast, this makes a natural end to Season One. Finishing a first draft is a HUGE milestone for a writer. So we want to celebrate our success by helping you find your own. So… as we look forward to Season Two: Mom Revises, we’ll kick off with a big giveaway! While we aren’t ready to release all the details just yet, let me list a few of the things you can look forward to in the first episode of Season Two. Details about a retreat, featuring the hosts of Mom Writes and, drumroll please… the hosts of the #AmWriting podcast, too! So, if you haven’t already subscribed to Mom Writes, DO IT! That way you don’t miss our launch of Season Two. In the meantime, enjoy a few weeks of encore Mom Writes episodes while we get ourselves set up to rock and roll revision. In episode 81, we talk about Mel’s logic problems in her submitted pages. Logic problems on a first draft are common, and easier to catch when you have someone else reading through your pages who can say, “Wait….what?” A lot of logic problems can be solved by simply putting more on the page – MORE thoughts, MORE feelings, MORE internal goings-on in your character’s mind and motivations. Once again, it’s the WHY that gets us. Jennie uses the example of Tom Cruise movies—everything is very clear, very well-explained, very black and white. We’re never left in the dark, we know the stakes, and that’s why it’s so suspenseful. We have to know why, or we’re not going to care. Generically “bad things” aren’t enough. Big drama isn’t powerful unless there’s big meaning behind it as well. Give the reader MORE MEANING. Jennie also brings up the big issue of Mel dancing around the sexual tension in her scenes – dancing around it isn’t working! She totally admits to chickening out, which is a common problem of the chronically awkward among us. Jennie assures her this is totally fixable, however – Mel needs to get the emotion and meaning on the page. She also admits that growing up in a very conservative culture has probably stunted her ability to express any sort of sexuality in her writing. Writing is about being vulnerable, however – the author has to be vulnerable in their work, and vulnerability in your characters helps us relate to them as we watch them change and grow.Give the reader MORE EMOTION. My only answer was this: I finally figured out what the hell was going on. And I put it on the page. And now I’m ready to tackle the revision and make the first 20 chapters match the last one! We talk a little bit about my last chapter and my introduction of a new character (who becomes my new favorite character and actually almost made Jennie cry). The new character, Sodapop, is actually a tip of the hat to my writing friend Lorrie Tom. We also talk about the underlying meaning that the books I’m incorporating have with the story. It’s subtle but knowing WHY some of these stories are important helps me make them important to my book as well. It gives them a meaningful role, not just a plot point. So join us as we celebrate an awesome and important writing milestone! This week on MomWrites we welcome Crystal Duffy, author of the recent release "Twin to Twin: From High Risk Pregnancy to Happy Family". covers her high risk pregnancy with her twin girls. Crystal tells us all about her harrowing journey through her pregnancy with blood clots, twin-to-twin transfusion syndrome, in-utero surgery, mono-mono twin risks, and her ultimate rise to author and patient advocate. Crystal feels her personal story has fueled her patient advocacy work, because no one knows you or your children's health better than you. Twin to Twin: From High Risk Pregnancy to Happy Family was written while Crystal was raising preemie twins AND a toddler! She soon realized that if she wanted to write this book, she had to let go of multiple things - laundry, clutter, household stuff - which was all still going to be there after the book was finished. She maximized her time while the kids were sleeping and used weekends and late nights while writing. There were sacrifices, but Crystal says she felt amazing and proud she felt when the first shipment of her books arrived, and how happy and excited her kids were as well. The process of writing books is pretty removed from any physical product for most kids, but seeing the books in print really helped them understand what Crystal had accomplished. Crystal is an Author Accelerator client and has listened to the #amwriting podcast with Jess and KJ, our co-podcasting nonfiction gurus. She went through the Blueprint program for her second book, and she's well into the process of writing book #2 with her coach. She assures Abby (and Mel) that writing a book IS (mostly!) easier the second time around! There are challenges from jumping genres from memoir to nonfiction and the process of weaving patient stories into research, but there are things you can do to make it easier. 1) Check in with yourself, and compile all your notes in one spot on a regular basis. 2) Outlining can be super useful for non-fiction. You still have to weave a tale, it's just with facts! 3) Writing your jacket cover, synopsis, and pitch beforehand can help you narrow your focus from an idea to a plan. This final tip Crystal recommends to us from Damon Brown’s book Bring Your Worth (coming out in February – www.damonbrown.net and www.bringyourworth.com – try to focus on completing 3 work-related things per day. Whether that’s an important email, several pages on your book, or other important tasks, anything beyond that is a blessing because inevitably, several other things will come up that will need your attention. Thanks for coming on the podcast, Crystal! Her book can be found on Amazon, Indiebound, Target, and wherever books are sold. Since we are on a temporary hiatus while our editor catches up from his mysterious and zombie-like illness, it’s time for another encore episode. Another Mom Writes favorite. It goes to a place that’s deep and dark. We connect my middle grade novel about a girl and her father’s magic library to something more. Something Jennie said this episode has always stuck with me. That it doesn’t matter what you’re writing, it always goes dark. Jennie and I chat about my daughter’s amazing male kindergarten teacher, “Mr. E,” while we wait for Mel to dial in. We chat about the Pete the Cat empire, Mr. E’s Pete the Cat scavenger hunt, and Jennie makes a confession about Amazon. Mel and I have a little mom competition over diapers. I talk about the Fort Worth Competitive Mom Circuit, and Jennie talks about the dreaded school car pool. “All the people are just alone in their own little bubble” of SAMENESS. I talk about going to see a medium, who I end up interviewing for the podcast (episode to come)! Jennie jokingly tries to edit my conversation as I tell the story. But I connect my visit to the medium with my writing as I tell the story about my best friend, Robyn, dying over a decade ago and how it has affected both my life and my writing. Jennie goes into full-blown therapist mode and reminds us that these deep WHYs are what we come to writing for. She also connects the book world I’ve written about in my story to the psychic realm, where characters go and can’t come back. I write about the first moment my main character notices a boy in middle school. I had just attended a workshop where the instructor said not to write about bodily sensations, which only served to challenge me to go back and write about bodily sensations… Jennie translates “don’t write body sensations” to “don’t write bad crap!” She persuades me to read part of the “body sensations” scene I wrote, and we talk about why it works. Massive amounts of information go through our heads really fast in the real world. Sometimes you have to figure out how to work in small connections in your writing, small important bits that your characters will process without belaboring them. It’s Thursday. And who doesn’t like a good #TBT? Especially when your podcast editor is deathly ill and temporarily out-of-commission. So, let us present you with a #TBT episode of Mom Writes. The Mom Guilt episode was our first “real” episode. I say “real” because not only were Melanie and I just starting our writing journey, but we were also starting our podcasting journey. This was pre- Jeremy Noessel (our fabulous and currently sick editor), so the audio was crappy. Crappy with a capital C. This is because I taught myself to edit a podcast using YouTube. This episode is definitely a snapshot of me— learning to write, learning to feel less guilty about chasing a dream, learning to edit podcasts. Despite my questionable audio editing skills, I am unashamed of this episode. (Despite an ugly review saying our advice was good but audio quality “unlistenable.”) Let this episode be an encouragement to the rest of you struggling under the mantle of self-doubt. When we first released this episode- and all the other early ones- I would press “publish” and immediately question if it was good enough. I would suppress feelings like, “Ugh! My voice!” and “I wish I had said X instead” and “I wish I hadn’t over-shared.” I still pretty much feel this way, just to a lesser degree! But here’s the thing. I kept hitting publish. We eventually quit interrupting each other so much. We eventually became more comfortable with each other and being recorded. We eventually had enough listeners to justify hiring an editor (who could edit out our chronic oversharing, of which we are still guilty). The early episodes were GOOD ENOUGH. You can’t get better without being good enough first. If you wait for things to be perfect, they will never see the light of day. So, that said, here’s our first #TBT Mom Writes episode all about MOM GUILT. Now, go forth and embrace your crappiness and rejoice! Today Jennie, Mel and I talk about the issues we face as creative people and parents, how to fit writing into your busy life, and the value of doing “intangible” work. Mom guilt -- how to lean in and accept that your creative endeavors matter to you. How do you balance motherhood/parenthood and maintain a productive writing habit? Sharing with your kids and your family what you’re doing -- tell them you’re writing and what you’re writing about. Your kids DO come first, but there is value in doing what matters to you. The importance of making an active decision to give something else up in order to make time for your writing (laundry, dishes, etc).